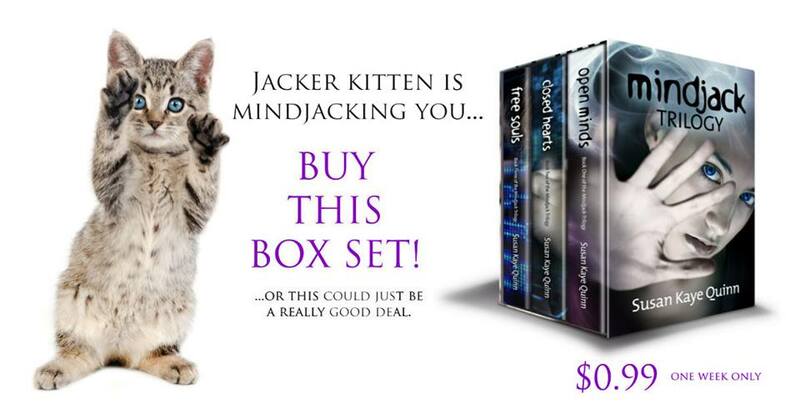 Get Mindjacked! Review and Special Sale! Hi there! 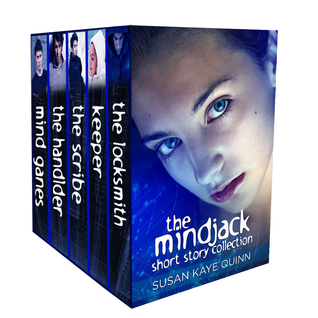 I’d love to share a review for a newly-published set stories from Susan Kay Quinn’s Mindjack universe. As you know, I devour books. Really. And, still, there are often times when I don’t have a large chunk of time to dig into a hearty novel. In those cases a novella or short story will tide me over. I especially love novellas that give me insight to books I’ve loved, so I was really glad to get a copy of the MINDJACK STORIES, which is a collection of novellas, short stories, vignettes and behind-the-scenes glimpses from Chicago New Metro in the near, and disturbed, future. This collection of short stories, vignettes and novellas in the Mindjack universe is a perfect companion for readers of the Mindjack series. For those who have read the trilogy (OPEN MINDS, CLOSED HEARTS, FREE SOULS) it is great to get insight from other characters in this world. The book opens with the bittersweet MIND GAMES featuring Kira’s childhood friend Raf, who is desperately in love with Kira but cannot express his feelings for her, due to her inability to read minds. His kind of love, that for a “zero” which Kira is, is considered wrong and unhealthy, and is turned against him to pressure him into being someone he is not. It’s definitely melancholy! There are some great flash fiction and world building elements added here, with excellent insight from the author regarding the world she has detailed. I naturally enjoyed THE HANDLER, because I pretty much love Julian. Watching him build his army of Jackers from the beginning is a thrill. I’ve always wondered about quiet, reticent Sasha, and his mind-overwriting power. It was a fearsome thing to consider, and his aversion to his own gift is acutely rendered in THE SCRIBE. In KEEPER, Kira’s obsessed with being on the strike force for the next JFA mission: attacking Kestrel’s stronghold and rescuing trapped jackers from experiments and torture. Julian won’t let her go knowing that Kira’s secondary objective is to kill Kestrel–and it’s clear Julian doesn’t want Kira in harm’s way. So, Kira develops her new talent in secret, hoping to make herself invaluable as a strike force member. And, in THE LOCKSMITH we get another game-changing jacker who has really difficult decisions to make. Interested? 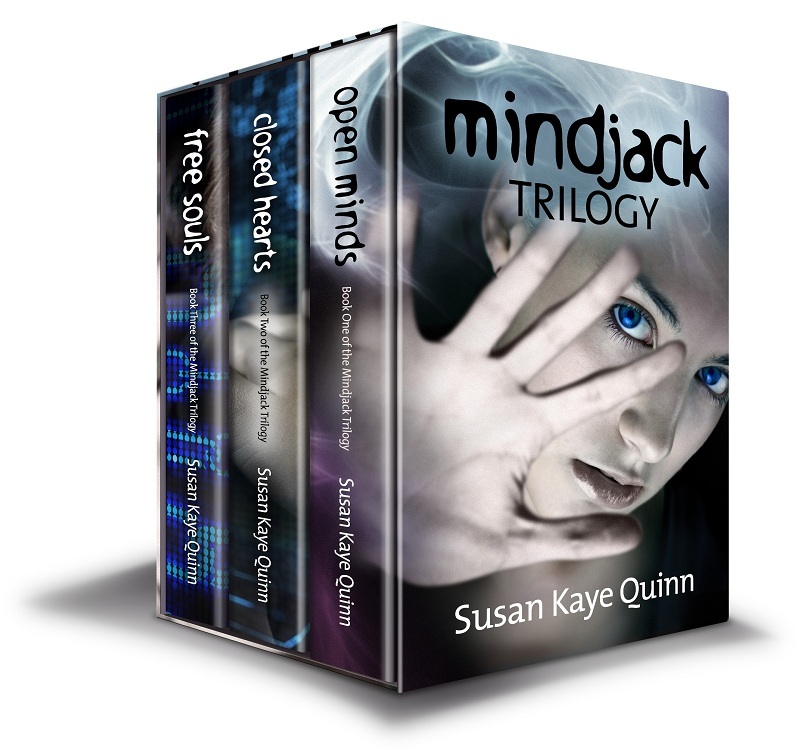 You can find MINDJACK STORIES on Goodreads and Amazon. Honestly, these stories are best enjoyed after (and between) reading of the MINDJACK trilogy. I have thoroughly enjoyed all the books in this series, and luckily enough, this three-book set is on SALE. A crazy sale, actually, because it’s $.99 this week on Amazon, Barnes & Noble iTunes, Google Play and Kobo. Ms. Quinn musta lost her mind. Anywho, it’s a great series, totally appropriate to teen readers, as well.